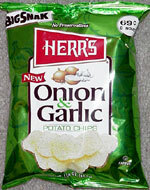 Taste test: These are large chips, giving you plenty to crunch on. They've got a lot of flavor, with a good garlic taste, like a bread stick, and some onion flavor to a lesser degree. Smell test: A strong potato smell, but no noticeable onion or garlic.